This is showing a terrain coverage map draped atop the heightfield. A coverage map shows what type of terrain is at that location. 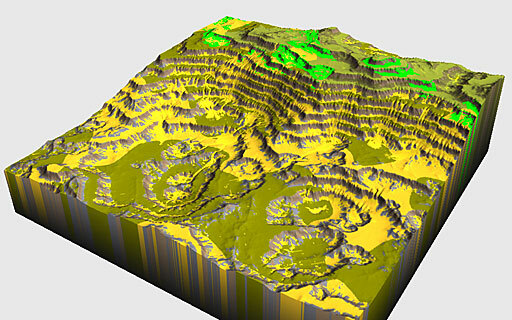 It’s NOT a terrain texture by itself; rather it’s a type of terrain metadata that specifies WHICH texture to use at a given location. The coverage map was created by the Coverage Maker device, which produces an RGB-encoded image, where each color is linked to a type of coverage. 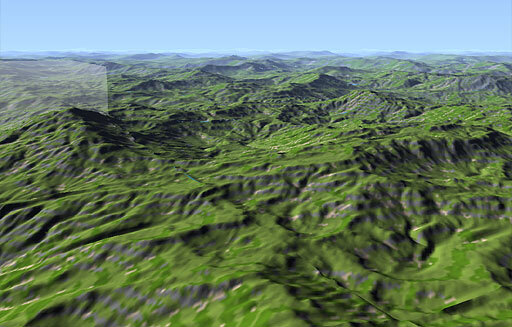 This allows you to setup your terrain surface texturing for the game or 3D app. You would then (in the engine or the next tool in the content pipeline) map each RGB triplet to a terrain texture to use, and you’re set! The coverage map seen here is pretty simple, using essentially three input maps: 1) A Hi-Slopes mask 2) A randomness map (basic perlin noise device 3) The Flow map from the erosion device. More details about the coverage maker later. Anyways, back to the Overlay Output. Since you can also now load RGB images into WM as well, you could, for example, load in an RGB image that you’ve sketched out quickly, and then use the Overlay output to combine it with a heightfield you’re working on to match the sketch. Or lots of other uses — you can probably imagine more than I can. Using a different map and coverage schema, and viewing in Explorer mode. Although it isn’t final texturing at all, it actually looks pretty good. It’s amazing how having some actual coverage-based coloration rather than just the height-based colormap gives a much stronger sense of realism for the terrain imho. Having this kind of coverage data available during heightfield creation, if taken advantage of, will allow for much faster terrain texturing on game maps and other such endeavors. I think focus is very important for tools, and although adding RGB support to WM is certainly an extension of its grasp., IÂ think terrain type coverage is a closely integrated problem with terrain modelling, and that puts it right into the purview of WM. If you need the ability to output Normal Maps/Coverage Maps/etc, then you have it. Otherwise, it doesn’t slow anything down. I’m really glad to see this kind of functionality going into WM! As a game developer, I’ve been thinking a lot about how to handle texture distribution on big portions of terrian. I’m wondering what the the resolution will be like at the texture transitions- is it dependent on the coverage map’s resolution? I guess it would have to be. But it would be super cool if it wasnt, because i can see all those coverage maps being quite expensive. This topic also brings to mind another thing I’ve been thinking about- object placement maps. I was always excited about the probability device, but it would be sweet if it had more rules built into it like: clumps, density, noise, slope, altitude, etc. Or even presets for rocks, trees, bushes. Regardless, i can’t wait for WM Pro! great job Stephen!